Post Graduate Institute of Swasthiyog Pratishthan, Station Road, Extension Area, Miraj, Maharashtra – 416410, India. Methods: A prospective study included 51 patients (IMN-25 patients, MIPO-26 patients). Two groups were compared for mean operative time, mean hospital stay, mean healing time, complications, reoperations and mean American Orthopaedic Foot and Ankle surgery (AOFAS) score. Results: Significant difference was observed in mean duration of hospital stay (p-0.0001). There was no significant difference in mean healing time and mean operative time in between the two groups. Mean AOFAS score was 88.24 ± 5.19 in IMN and 86.96 ± 6.9 in MIPO group and the difference was not significant (p-0.78). Malalignment was higher in MIPO group (15.3%) as compared to IMN group (12%) but there was no statistically significant difference (p-0.36). One patient in MIPO group in which fibular osteotomy was done developed valgus deformity. Incidence of infection was higher in the MIPO group (11.5%) as compared to IMN group (4%) but the difference was not significant (p=0.15). Non-union, delayed union and resurgeries were almost similar between the two groups. Conclusion: Both IMN and MIPO can be safely used to treat distal tibia extra-articular fractures but IMN has the definite advantage of shorter mean hospital stay duration. Fibula fracture, if in distal third should be fixed as it aids in tibia reduction and imparts additional stability to the fixation. The role of fibular osteotomy in simple distal tibia fractures remains controversial and demands further studies. Key words: Distal tibia, extra-articular fractures, MIPO, fibula fixation, intramedullary nailing, prospective study. Extra-articular Distal tibia fractures are often difficult to treat since they are close to the ankle joint, usually associated with soft tissue injuries. Minimal invasive Plate osteosynthesis (MIPO) using Locking compression plate (LCP) has replaced the conventional open reduction method since smaller incision and indirect reduction preserves the fracture hematoma and soft tissue vascularity(1). Literature review suggest that both MIPO and Intramedullary nailing (IMN) has been successful in the management of these fractures, but the results are controversial among the two (2-4). MIPO is associated with wound problems, Plate prominence(5), mal-alignment and non-union(6). IMN avoids some of these problems but the technical difficulty in insertion and the risk of mal-union (7), anterior knee pain poses a great challenge in orthopaedics (4). Our hypothesis was that patients treated with IMN has a better outcome than treated with MIPO. The aim of this study is to compare the clinical, radiological and functional outcome of these fractures treated with IMN and MIPO. All surgeries were performed by the same senior surgeon. One hour preoperatively all patients received intravenous third generation cephalosporin and an aminoglycoside. Fibula fracture, if in distal third was fixed first with either 3.5 mm one-third plate or an elastic nail and its fixation is independent of tibial method of fixation. The operative technique of IMN is same as described elsewhere. (7, 9, 11) Multifunction tibia nail (MTN) with three distal locking screws (Nebula surgicals, Gujarat, India) was used in all the cases. Special measures were taken to prevent anterior knee pain during IMN(12). Medial parapatellar approach with entry point below the knee joint with preservation of Hoffa’s fat pad was used and nail was buried into the bone in both coronal and saggital axis. Guide wire was kept exactly in the centre to prevent mal-alignment.(11). Accurate closed reduction of the fracture was verified before insertion of the ball-tip guide. (7) Poller screws(10) were used either as a reduction aid, to keep the nail in the centre, to correct the deformity at the fracture site, to narrow the effective diameter of the widened metaphyseal region and provide extra stability. At least two distal static locking screws were put, if possible one antero-posterior screw was also put. Post-operative protocol was same for both the procedures. Antero-posterior and lateral xray views were taken after the surgery, first dressing inspection was done on post-operative day (POD) two, and stitches were removed after two weeks. Non-weight bearing and active ankle and knee mobilization was started on POD two. Patients were discharged three or four days after surgery. First Follow up was done after two weeks, then monthly follow up with clinical and radiological examination done at every visit until bony union was achieved. Radiologically patients were evaluated for signs of union, delayed union and non-union and malunion. Union of the fracture was assessed using the criteria described by Sarmiento et al(19). 2) Visible bridging callus across the fracture on the radiograph. Normal time to union was considered to be 24 weeks. No signs of union at nine months was considered to be a non-union. Healing time from six months to nine months was considered to be a delayed union. Mal-union was defined as a varus or valgus deformity > 5°, an anterior/posterior angulation > 10°, a rotational deformity > 10°, and shortening > 10 mm.(20). Partial weight was allowed when the xrays shows some some signs of union, usually after six weeks of operation. Full weight bearing was allowed on the individual basis as tolerated by the patient and depending upon the progress of union. Patients were clinically evaluated for the signs of infection, skin maceration and pain at the fracture site, anterior knee pain and functional scoring system using American Orthopaedic Foot and Ankle surgery (AOFAS)(21) scoring at minimum 1 year follow up. Superficial infection was confined to dermal and subcutaneous tissue whereas deep infection was defined as those below the deep investing muscular fascia. (1) Informed consent was obtained from all the patients before operation. Parametric tests of significance were applied after testing normality of data. Incidence of adverse outcomes in the procedures was compared by using standard normal test for difference in proportions. Mean AOFAS scores was compared using unpaired t test. 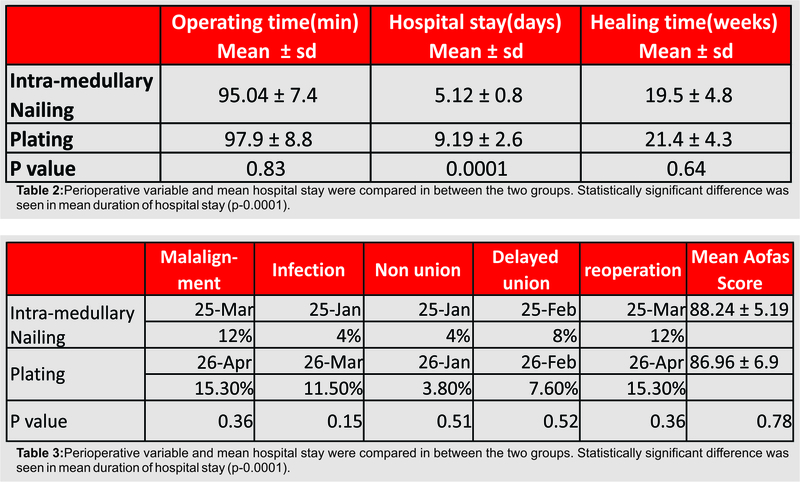 Complications (Table 3) included malalignment, infection, non-union, and delayed union. One patient in MIPO group in which fibular osteotomy was done developed valgus deformity Although the malalignment was higher in MIPO group (15.3%) as compared to IMN group (12%) but the difference was not statistically significant (p-0.36). 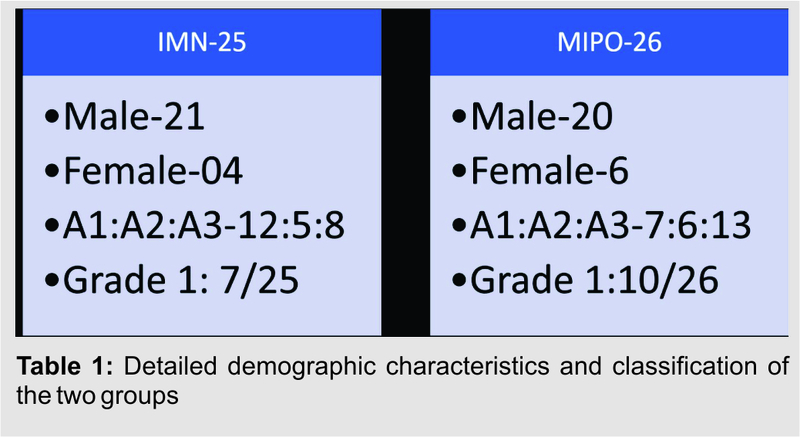 Incidence of Infection was higher in the MIPO group (11.5%) as compared to IMN group (4%). Two out of three cases of infection in MIPO group and one case in IMN group were open grade 1 wound. Statistical analysis showed that there was no significant difference in incidence of infection in between the groups. Non-union and delayed union were almost similar in between the two groups and there was no significant difference. Resurgeries were more common in MIPO group (15.3%) as compared to IMN group (12%). There was no significant difference (p-0.36) in the incidence of resurgeries in between the groups. A total of 13 cases in IMN group required the use of poller screws. In seven out of 13 cases, poller screws were used in the first surgery to provide stability to the fracture site. In four patients they were used intraoperatively as an aid to reduction. Two cases (one of type 43A1 and A2 each) required addition of poller screws in second surgery at eight weeks interval, to prevent the progression of delayed union. The fracture subsequently healed in next 12 weeks. The fixation of fibula in distal tibia fibula fractures is controversial. Teitz, C.C et al(22) concluded that when the fibula remains intact, a tibiofibular length discrepancy develops and causes altered strain patterns in the tibia and fibula. These may lead to delayed union or non-union of the tibia with the sequelae of joint disturbances. There are several reports that recommend plating concomitant ﬁbular fractures in distal tibial fractures in order to achieve increased stability and reduce the risk of primary or secondary malalignment(11). Strauss et al(23) concluded that an intact fibula in the presence of a distal tibia fracture improved the fracture fixation stability for both treatment methods. In fracture patterns in which the fibula cannot be effectively stabilized, locked plates offer improved mechanical stability when compared with locked intramedullary nails. They also concluded that if fibula is fractured at same level the mechanical stability of both the groups’ decreases, IMN in particular. Taylor et al(24) concluded that addition of fibular fixation does not affect whether or not alignment is maintained in either the immediate post-operative or short-term follow-up period. In our series, in MIPO group, 24 patients had fibula fracture, 19 fractures were fixed. Rest of the fibular fractures were in proximal two-third portion of the fibula or it was intact. In one case where fibular osteotomy was done, patient develop post-operative valgus deformity on follow ups This valgus deformity was thought to be the caused by the collapse at the fracture site due to unsupported distal lateral wall. Although it showed some signs of delayed union but eventually the fracture united. This delayed union might be caused because of the ineffective compression achieved by screw which acts mostly as a neutralization screw rather than lag screw. (15, 18). Further it was observed that in cases in which fibula was fixed, none developed deformity. In IMN group, 16 patients had fibula fracture in the distal one-third and all were fixed. Most studies suggest that fibula fixation improves the result in IMN group but this study suggest that it might improve the results in MIPO group also. In spite of small sample size and multiple confounding factors such as both elastic nail and plate were used for fixation that might affect the outcome differently, the observation of valgus deformity in MIPO group after fibular osteotomy creates a controversy for doing fibular osteotomy in simple fractures and the need for fibular stability in this group. MIPO has gained popularity with the development of LCP. Closed IMN is another less invasive method which spares the extra osseous blood supply, allows load-sharing and avoids extensive soft-tissue dissection(4, 7). There are not much prospective studies in which the results of MIPO are compared with those of IMN. Guo et al (7) a randomized control trial, compared both methods in 111 patients. They concluded that both closed IMN and LCP with MIPO can be used safely to treat OTA type-43A fractures. Closed nailing has the advantage of shortened operating and radiation time and ease of removal of hardware. A randomized pilot trial done by C.Mauffrey (9) suggests that there may be clinically relevant, functional differences in patients treated with nail versus locking-plate fixation for fractures of the distal tibia and differences in related complications. The use of poller screws has been studied in detail by Krettek et al.(26). He advocated the use of poller screws on the concave side of deformity to achieve reduction, and screws on both sides of the nail in proximal and distal fragment, to achieve stability. This method of placing the poller screws on both sides of the nail in proximal and distal fragment effectively narrows the diameter of medullary canal, thereby providing the stability. The current authors have used the above described technique of poller screw insertion and has got successful results in preventing delayed union. The use of poller screw in fresh fracture has not been studied in the present study and is limited by the varied fracture configuration as a confounding factor. The main limitation of this study is small sample size in each group and short follow up time. Long term effects of the deformity at the fracture site on the nearby ankle joint has to be considered in further follow ups. Nailing has the advantage of significantly shorter duration of mean hospital stay. Although complication rates are similar in both the groups, all authors preferred IMN for extraarticular type 43A distal tibia fracture provided at least two locking screws can be inserted distally. The fibula fracture, if in distal third should be fixed as it aids in tibia reduction and imparts additional stability to the fixation. The role of fibular osteotomy in simple distal tibia fractures remains controversial and demands further studies. The use of poller screws definitely helps in prevention of delayed union. 1. Zou J, Zhang W, Zhang CQ. Comparison of minimally invasive percutaneous plate osteosynthesis with open reduction and internal fixation for treatment of extra-articular distal tibia fractures. Injury. 2013;44(8):1102-6. 2. Cabrolier J, Molina M. Is intramedullary nailing superior to plating in patients with extraarticular fracture of the distal tibia? Medwave. 2015;15(Suppl 3):e6306. 3. Mao Z, Wang G, Zhang L, Zhang L, Chen S, Du H, et al. Intramedullary nailing versus plating for distal tibia fractures without articular involvement: a meta-analysis. Journal of orthopaedic surgery and research. 2015;10:95. 4. Li B, Yang Y, Jiang LS. Plate fixation versus intramedullary nailing for displaced extra-articular distal tibia fractures: a system review. European journal of orthopaedic surgery & traumatology : orthopedie traumatologie. 2015;25(1):53-63. 5. Lau TW, Leung F, Chan CF, Chow SP. Wound complication of minimally invasive plate osteosynthesis in distal tibia fractures. International orthopaedics. 2008;32(5):697-703. 6. Borg T, Larsson S, Lindsjo U. Percutaneous plating of distal tibial fractures. Preliminary results in 21 patients. Injury. 2004;35(6):608-14. 9. Mauffrey C, McGuinness K, Parsons N, Achten J, Costa ML. A randomised pilot trial of “locking plate” fixation versus intramedullary nailing for extra-articular fractures of the distal tibia. The Journal of bone and joint surgery British volume. 2012;94(5):704-8. 10. Newman SD, Mauffrey CP, Krikler S. Distal metadiaphyseal tibial fractures. Injury. 2011;42(10):975-84. 11. Andreas H. Ruecker MH, Martin E. Rupprecht, Johannes M. Rueger1. Distal Tibial Fractures: Intramedullary Nailing European Journal of Trauma and Emergency Surgery. 2009. 12. Labronici PJ, Santos Pires RE, Franco JS, Alvachian Fernandes HJ, Dos Reis FB. Recommendations for avoiding knee pain after intramedullary nailing of tibial shaft fractures. Patient safety in surgery. 2011;5(1):31. 13. Pirolo JM, Behn AW, Abrams GD, Bishop JA. Anterolateral Versus Medial Plating of Distal Extra-articular Tibia Fractures: A Biomechanical Model. Orthopedics. 2015;38(9):e760-5. 14. Horn C, Dobele S, Vester H, Schaffler A, Lucke M, Stockle U. Combination of interfragmentary screws and locking plates in distal meta-diaphyseal fractures of the tibia: a retrospective, single-centre pilot study. Injury. 2011;42(10):1031-7. 15. Vidovic D, Matejcic A, Ivica M, Jurisic D, Elabjer E, Bakota B. Minimally-invasive plate osteosynthesis in distal tibial fractures: Results and complications. Injury. 2015;46 Suppl 6:S96-9. 16. Tsukada S, Otsuji M, Shiozaki A, Yamamoto A, Komatsu S, Yoshimura H, et al. Locking versus non-locking neutralization plates for treatment of lateral malleolar fractures: a randomized controlled trial. International orthopaedics. 2013;37(12):2451-6. 17. Mardian S, Schaser KD, Duda GN, Heyland M. Working length of locking plates determines interfragmentary movement in distal femur fractures under physiological loading. Clinical biomechanics. 2015;30(4):391-6. 18. Hasenboehler E, Rikli D, Babst R. Locking compression plate with minimally invasive plate osteosynthesis in diaphyseal and distal tibial fracture: a retrospective study of 32 patients. Injury. 2007;38(3):365-70. 19. Sarmiento A, Latta LL. 450 closed fractures of the distal third of the tibia treated with a functional brace. Clinical orthopaedics and related research. 2004(428):261-71. 20. Milner SA. A more accurate method of measurement of angulation after fractures of the tibia. The Journal of bone and joint surgery British volume. 1997;79(6):972-4. 21. Kitaoka HB, Alexander IJ, Adelaar RS, Nunley JA, Myerson MS, Sanders M. Clinical rating systems for the ankle-hindfoot, midfoot, hallux, and lesser toes. Foot & ankle international. 1994;15(7):349-53. 22. Teitz CC, Carter DR, Frankel VH. Problems associated with tibial fractures with intact fibulae. The Journal of bone and joint surgery American volume. 1980;62(5):770-6. 23. Strauss EJ, Alfonso D, Kummer FJ, Egol KA, Tejwani NC. The effect of concurrent fibular fracture on the fixation of distal tibia fractures: a laboratory comparison of intramedullary nails with locked plates. Journal of orthopaedic trauma. 2007;21(3):172-7. 24. Taylor BC, Hartley BR, Formaini N, Bramwell TJ. Necessity for fibular fixation associated with distal tibia fractures. Injury. 2015;46(12):2438-42. 25. Barcak E, Collinge CA. Metaphyseal Distal Tibia Fractures: A Cohort, Single-Surgeon Study Comparing Outcomes of Patients Treated With Minimally Invasive Plating Versus Intramedullary Nailing. Journal of orthopaedic trauma. 2016;30(5):e169-74. 26. Krettek C, Miclau T, Schandelmaier P, Stephan C, Mohlmann U, Tscherne H. The mechanical effect of blocking screws (“Poller screws”) in stabilizing tibia fractures with short proximal or distal fragments after insertion of small-diameter intramedullary nails. Journal of orthopaedic trauma. 1999;13(8):550-3. How to Cite this article: Malve SP, Arora N, Kulkarni SG, Gehlot H, Mallikarjun, Garg D. Comparison of surgical management of extra-articular distal tibia fractures treated with closed intramedullary nailing and minimally invasive percutaneous plate osteosynthesis- a prospective study. Journal of Trauma and Orthopaedic Surgery.Jan – March 2017;12(1):7-11.